Time passes quickly, and now Android Auto is already aged 3 months after its official announcement, and prepares to land on commercial vehicles by the end of year / beginning of 2015 . So let's look at some details of the interface that we will find on board , as described in the Android Developer Overview Auto. 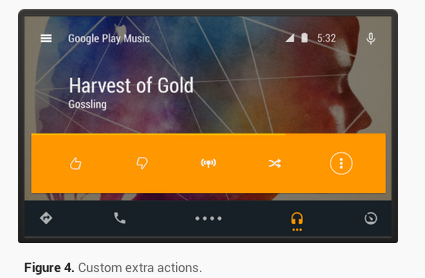 A little 'how to Wear on Android, including Android Auto , the idea is to extend the normal functioning of the Android app that rotate correctly in the interface designed by Google for cars: we speak in particular of app dedicated to music , podcasts, the radio, and in general to the audio industry, which keeps us always in the car company. They will of course also present all the notifications on your smartphone, how about Android Wear, and voice commands will be even more in the center of the experience. 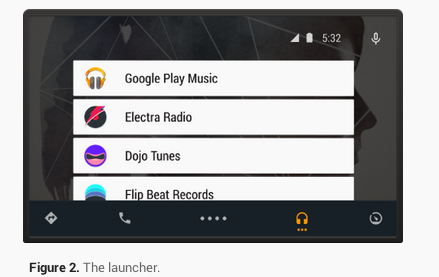 The launcher is, however, much simpler than Android, and displays a list of cards ordered vertically with all media compatible app installed on your smartphone coupled, we can perform on the dashboard of the car. The UI of each app is different from that which we are accustomed, and customizable with icons and background images;are also four primary actions on the action bar and four additional overflow on the bar, which are also configurable by the developer. Also the drawer of each app can be customized, although following a scheme quite predetermined, and finally are present both day mode that the night mode (also coming in Android L? ), so as to change the tones of the application to not be too "dazzling" evening. L ' Auto Android SDK will only come in the next few months. Interested developers can consult the official website for more technical details.